MILWAUKEE — It was a history making night for the No. 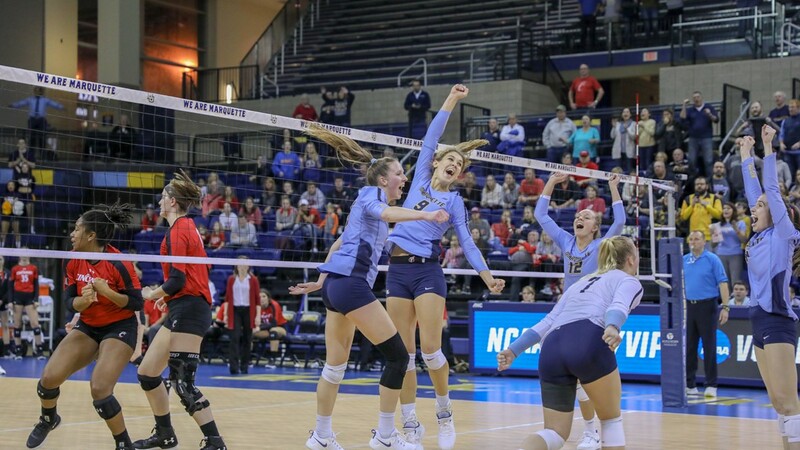 14 seed Marquette University volleyball team as the Golden Eagles swept Cincinnati (25-19, 25-21, 25-16) to reach the round of 16 in the 2018 NCAA Championship for the first time in program history. Junior Allie Barber led with a match-high 18 kills and a .400 hitting percentage, while sophomore Hope Werch connected for eight kills. Junior Lauren Speckman and sophomore Sarah Rose handed out 21 and 12 assists in the match, while senior Anna Haak collected 12 digs. Marquette (28-6) went back and forth with the Bearcats (26-8) in the opening set, trading the lead twice and seeing the score tied eight times before the Golden Eagles used a 6-2 run to close out the frame. The Bearcats did not go quietly in the second set holding off MU’s set point twice before an attack error gave the Golden Eagles a win behind a .310 combined hitting percentage in that set. In the third, Marquette led in its entirety as a kill from Haak closed out the match for the history-making victory. The Golden Eagles collected 11 team blocks as senior Jenna Rosenthal and freshman Ellie Koontz turned in six, often teaming up for the point. Sophomore Elizabeth Orf was also a strong presence at the net, turning in four blocks in the victory. Marquette will travel to No. 3 Illinois and face the Illini in the round of 16 on Dec. 7 in Champaign. MILWAUKEE, Wis. – The University of Cincinnati volleyball team saw its historic season come to an end Saturday night as the Bearcats fell to No. 14 seed Marquette 3-0 in the second round of the NCAA Tournament. The 2018 team will go down as one of the best in program history. 26 wins on the season is the fifth-most in the rally scoring era. Also in the rally scoring era, a .274 hitting percentage and 1,750 total assists both rank second all-time while 1,860 kills ranks third. Since the start of the UC volleyball program, the team’s attack percentage ranks as the third best ever. 1,860 total kills and 1,750 total assists are also American Athletic Conference single-season team records. The 2018 Bearcats were just the fifth UC volleyball team to ever advance to the second round of the NCAA Tournament. Neither team was able to get out ahead early on in the opening set. Dasha Cabarkapa and Maria Mallon scored the Bearcats’ first point on a block. Two Thompson kills helped keep UC close and an ace by Chrysanthi Stamatiou tied the set at six. Errors by the Golden Eagles tied the set at eight and nine later on. Up one, 13-12, Marquette went on a 4-0 run, but UC kept it close by answering with a 3-0 run, as Kostelac had back-to-back kills and Cabarkapa and Tingelhoff had a block to keep the lead within two. Marquette was able to string points together late to pull off the set victory. The Golden Eagles took 4-1 lead to start the second set, but the Bearcats continued to battle to the end. A 3-0 run thanks to two Marquette errors and a Kostelac kill had UC trailing by one, 9-8. Down by four, 14-10, Mallon closed the gap with a kill. With Marquette leading by six late, Mallon and Thompson had kills and Tingelhoff had a block to give UC some momentum. Facing set-point, UC stayed alive on a kill by Jones and a Marquette attack error, putting the score at 24-21. Marquette called a timeout and regrouped and was able to take the first point out of the huddle to take a 2-0 match lead. A 4-0 run started the set for Marquette, but UC once again had a late surge to keep it close. Down 8-2, the Bearcats scored three-straight on a Tingelhoff and Jones block and two attack errors. Later on facing a 12-6 deficit, a MU service error, kill by Cabarkapa, back-to-back kills by Kostelac and another Golden Eagles error made it a one-point set, 12-11. Marquette then called a timeout, and unfortunately put together a run of their own out of the break. A 6-0 scoring spurt put the lead at 18-11. Late kills by Jones, Thompson and Tingelhoff kept the Bearcats in it, but a UC attack error and Marquette kill ended the match.